Ok, so when I was in my last year of University at Queen’s I was talking to some people from the southern US on-line who happened to be big fans of a number of indie groups I’d been into for a while like Jets To Brazil, Pedro The Lion and At-The Drive In. 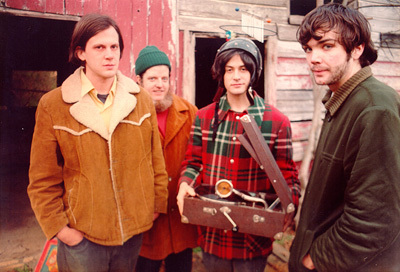 In the course of the conversation somebody mentioned this band Neutral Milk Hotel, who at that time I had never heard of. Now for those of you who don’t listen to indie music, all of the aforementioned were formed and gained popularity during the 1990’s. At The Drive-In broke up in 2001, and subsequently the members formed the two groups Mars Volta, and Sparta – both of which are now signed to major labels. Pedro The Lion formally broke up earlier this year, though founder Dave Baizan continues to work on solo projects and in the group Headphones. Jets To Brazil broke up in 2003 following the release of their 3rd album. You may be noticing a trend here… apparently indie acts age like the rest of us and move onto bigger things, either personally or professionally. I listed above had an arc that lasted between 6 and 12 years, it’s a bit surprising to think that the most musically inventive of the bunch came and went with only 2 full-length releases, 1 EP, and a collection of live recordings(you can listen to some of them here) over a span of 4 years . Jim actually grew up with the same people who were to be his support network in the Elephant Six Collective of Athens, Georgia. Considering the acts to come out of the collective include notables such as The Apples In Stereo, Beulah, Olivia Tremor Control, Of Montreal, and Elf Power; it’s not particularly surprising to see how NMH has made it’s mark. What is interesting is that while Jim happened to be a founding member of the collective, he’s distanced himself from his own recordings, avoiding the spotlight and preferring to focus on his love of Bulgarian Folk Music, and Sonic Collage. A man that can claim to have lived for a month in a haunted closet listening to John Coltrane, before recording his first full-length album, most of which was fleshed out at the Pet Sounds Studio in Denver, is going to inevitably remind me a bit of Brian Wilson. He now resides with a sizable portion of the now defunct Elephant Six collective at the Orange Twin Conservation Community, located on 100 acres of forest outside of Athens. They also happen to run a record label by the same name in town, which will possibly release past works of NMH in the future. Not quite the same trajectory, but influential nonetheless. Again, here’s In an Aeroplane Over the Sea by Neutral Milk Hotel.